Western blot analysis of extracts from mouse lung, and J774.1 and NIH/3T3 cells using CD39/NTPDase 1 (E2X6B) XP® Rabbit mAb (Mouse Specific) (upper) and β-Actin (D6A8) Rabbit mAb #8457 (lower). Immunohistochemical analysis of various paraffin-embedded normal mouse tissues: spleen (top-left), heart (top-center), kidney (top-right), liver (bottom-left), pancreas (bottom-center) and skeletal muscle (bottom-right) using CD39/NTPDase 1 (E2X6B) XP® Rabbit mAb (Mouse Specific). 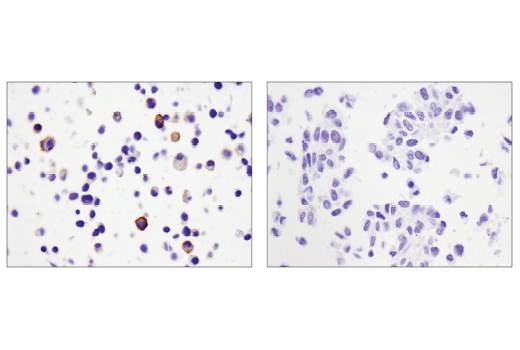 Immunohistochemical analysis of paraffin-embedded J774A.1 cell pellet (left, positive) or NIH/3T3 cell pellet (right, negative) using CD39/NTPDase 1 (E2X6B) XP® Rabbit mAb (Mouse Specific). 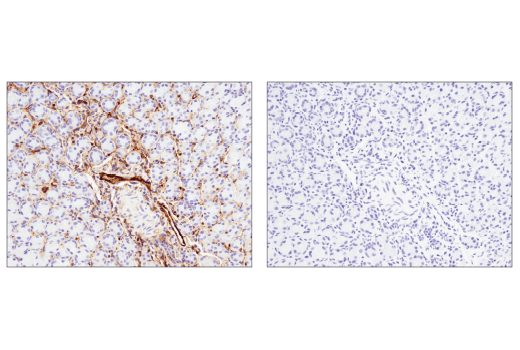 Immunohistochemical analysis of paraffin-embedded mouse stomach using CD39/NTPDase 1 (E2X6B) XP® Rabbit mAb (Mouse Specific) (left) compared to concentration matched Rabbit (DA1E) mAb IgG XP® Isotype Control #3900 (right). 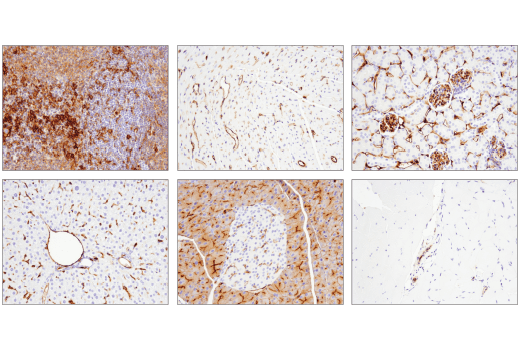 CD39/NTPDase 1 (E2X6B) XP® Rabbit mAb (Mouse Specific) recognizes endogenous levels of total NTPDase 1 protein. 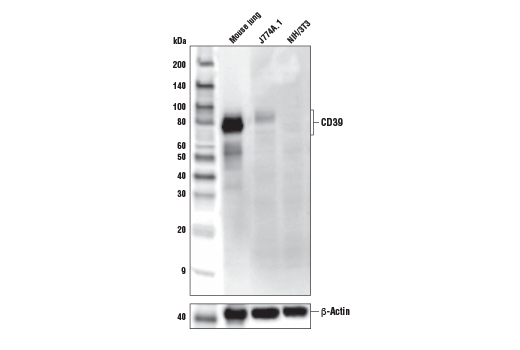 Monoclonal antibody is produced by immunizing animals with a synthetic peptide corresponding to residues surrounding Leu307 of mouse NTPDase 1 protein. Ectonucleoside triphosphate diphosphohydrolase 1 (NTPDase 1, also known as CD39) is a multi-pass membrane ectoenzyme that metabolizes adenosine tri-phosphate (ATP) to regulate purinergic signaling. Purinergic signaling by extracellular ATP and its metabolites regulate many biological processes, including vascular tone, digestion, neuronal function, and inflammation in both normal and diseased states (1). NTPDase 1 is expressed in endothelial cells in the vasculature to regulate local platelet purinergic signaling via metabolism of ATP to adenosine (2). Accordingly, NTPDase 1 regulates platelet activation aggregation and contributes to the antithrombotic properties of endothelial cells (3). ATP and its metabolites also finely modulate the activity of T cells and macrophages (4, 5). Immunomodulation is regulated, in part, by the availability of extracellular ATP and adenosine, suggesting that NTPdase 1 (CD39) may play an immunosuppressive role in the tumor microenvironment. Burnstock, G. and Ralevic, V. (2014) Pharmacol Rev 66, 102-92. Kauffenstein, G. et al. (2010) Cardiovasc Res 85, 204-13. Pinsky, D.J. et al. (2002) J Clin Invest 109, 1031-40. Ohradanova-Repic, A. et al. (2018) Front Immunol 9, 852. Deaglio, S. et al. (2007) J Exp Med 204, 1257-65.